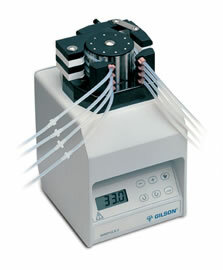 Gilson’s MINIPULS 3 is a peristaltic pump specifically designed to meet process laboratory liquid handling needs. It combines microprocessor speed control with a high-torque stepper motor. Excellent flow rate accuracy and reproducibility with pulse-free flow. High chemical resistance and motor speed stability. Always ready to use with a two-minute installation and quick change of pump head. Reliable liquid transfer even in the most challenging environments with its solid construction from robust, chemically resistant materials. The cam snaps into place! Tubing in any channel can be changed easily and independently. A wide range of flow rates and back pressures with a choice of interchangeable pump heads. Fine-tuning of the pressure on the tubing helps prolong tubing life. PVC (Tygon®) for general use. Fluoroelastomer (Isoversinic®) where high-chemical resistance is required. PharMed® for pharmaceutical and food. Pump head with up to 10 rollers. 6 fully interchangeable pump heads. 4 types of tubing materials.